GST rates for services has been released by Finance Minister The five slabs are in line with the tax rates for goods — 0% ,5%, 12%, 18% and 28%. The general rate of 18 % is applicable on most of the services where no specific rate has been prescribed. 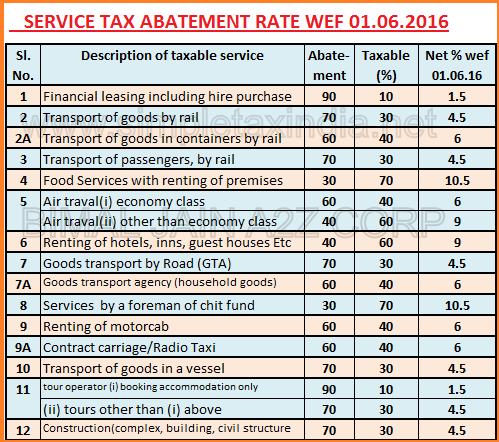 Means where ever 15 % rates is applicable under service tax now 18 % rates is applicable ,so most of the services will be costlier. But one point we would like to mention here that now input tax credit on goods is also available to service provider and so the effective rate increase should be lower. Only five services — including five-star hotels, movie tickets, racing, betting on racing and casinos — will attract 28% levy. All exemption as available under earlier under service tax regime will be more or less will also remains exempted under GST ,Most importantly Education and healthcare will continue to be exempted. General GST rate on services is 18 % ,so where ever 15 % was applicable now you have to pay 18% except prescribed otherwise.So Telecom Banking services will be covered under 18% under GST. Input Tax credit on Goods and service consumed to provide the services is available under GST ,so effective tax will be reduced. GST rate on Small restaurant up to 50 lakh sales have a option of 5 % GST. Non ac restaurants GST rates is 5%.Earlier it was exempted. 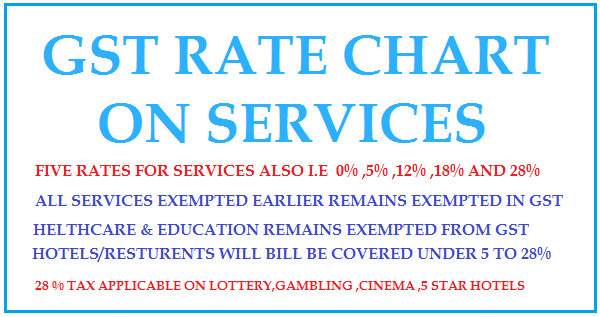 AC restaurants GST rates is 12% ,Earlier 12.5% Vat and 6% service tax was applicable. Hotel room up to Rs 1000 exempted.Earlier also exempted. Hotel rooms above 5000 is under 28 % rates .Earlier 9% is applicable under service tax plus state tax which is 10-15% luxury tax . Works contract is under 12% GST rates ,Input tax credit on goods available.Earlier VAT and service tax is applicable 7-13% with restricted input tax conditions . Normal Rail passenger(non ac) and metro exempted. Earlier exemption on Financial lease/ chit fund /Tour & travel /Catering is allowed but no clarification on these service available. Five services — including five-star hotels, movie tickets, racing, betting on racing and casinos will attract 28% levy. Check video recording of Press statement by Finance Minister.